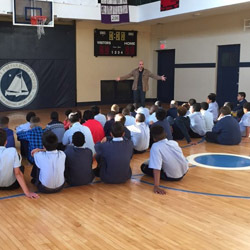 Nativity Preparatory School is an independent, tuition-free school for boys in grades five through eight from low-income families in the New Bedford area. Nativity Prep seeks to foster the intellectual, moral, social, and athletic growth of its students, and to nurture in a small-school setting the full potential of their whole character. The goal is to graduate young men who are academically prepared for further education, inspired to lead their lives with humility, and dedicated to serving others. All members of the Nativity community strive to help boys of promise become lifelong learners who will contribute productively to the world they inherit – “Men for Others.” The School’s faculty and staff work closely with students’ families and other volunteers, building ties between school and community and developing the kinds of personal and institutional supports that will ensure the continuing success of Nativity students in high school, college, the workforce, and life. 80% of NP alumni have pursued further education at a college or university following high school. 15% of NP alumni have gone directly into the workforce or military following high school. 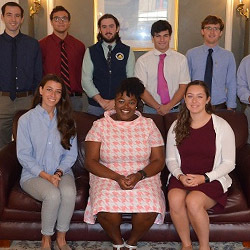 Students complete 25+ hours of community service annually through core programming. Students can participate in up to 375 additional hours annually of academic and extracurricular programming compared to peer schools. We commit each day to our life-long quest for Scientia – Knowledge – because through it we gain power, perspective, and purpose. We strive to embody Virtus – Virtue – because the world needs men of excellence and worth to solve problems and stand for what is right. We actively build a culture of Fides – Trust – because our communities grow strongest when we have faith in and can rely on one another.